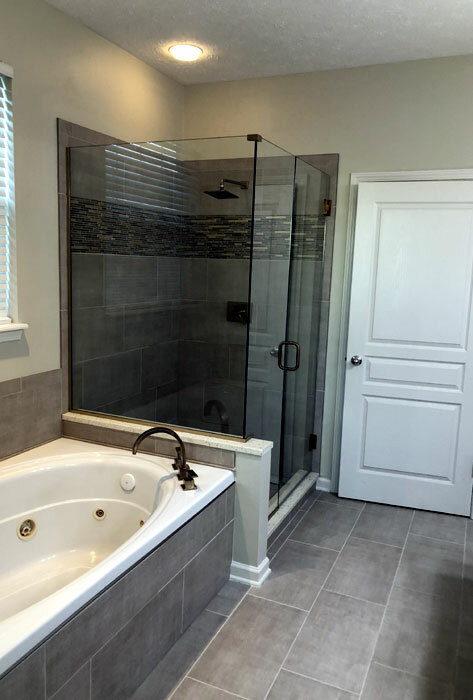 Mr. and Mrs. W. were anxious to make long-awaited upgrades to their Master Bathroom with the end-goal of preparing their home for resale as they near retirement. 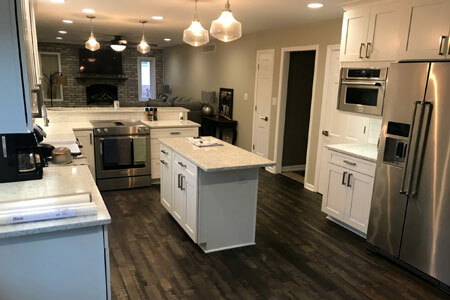 There are certain bathroom features to which today's home buyers seem to be drawn - tile shower pans, floating cabinetry, and the #farmhouse white and gray color scheme are definitely on that list. 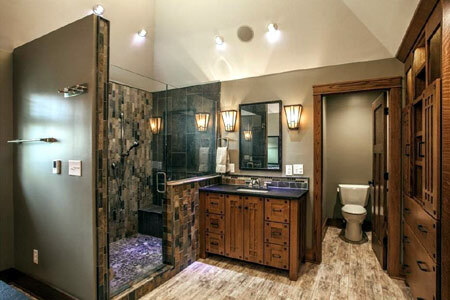 As with most bathroom remodels, creating a larger shower was the top priority. A custom-sized 48" x 44" shower pan was installed and overlaid with 2x2 mosaic tile with a square drain cover to create clean lines. Large format 12 x 24 wall tile was installed to 7-foot height in a horizontal set with a 1/3 offset. 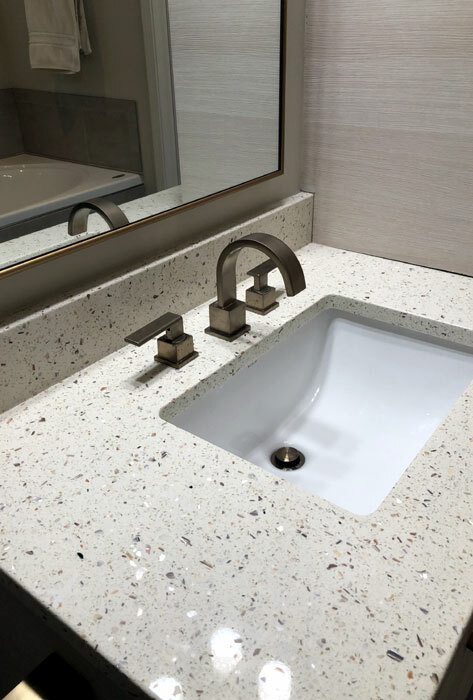 A wide horizontal band of Duality Trifecta stone and glass mosaic tile was used as the final detail to tie together the tile color and the Champagne Bronze finish of the new plumbing fixtures. 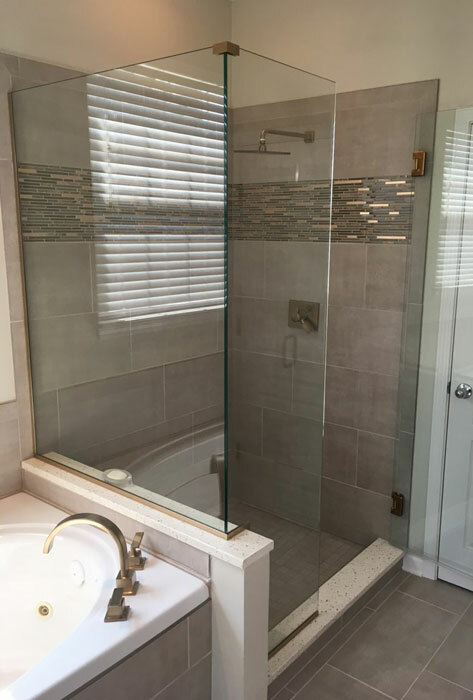 Of course, we did not want to hide any of that beautiful tile work, so a custom 3/8" clear glass 2-sided shower enclosure with matching metal accents was just the right choice! 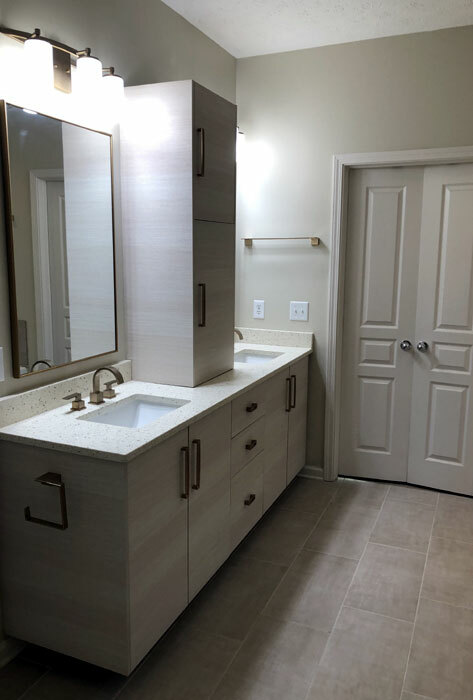 At the vanity area, the large 1-piece mirror was removed allowing for placement of a tower cabinet for additional storage with his-and-her framed mirrors on each side. The floating cabinetry creates a contemporary look, and, along with the lighter colors, causes the space to feel more open. The countertop is quartz with undermount rectangular bowls - again, think straight lines! 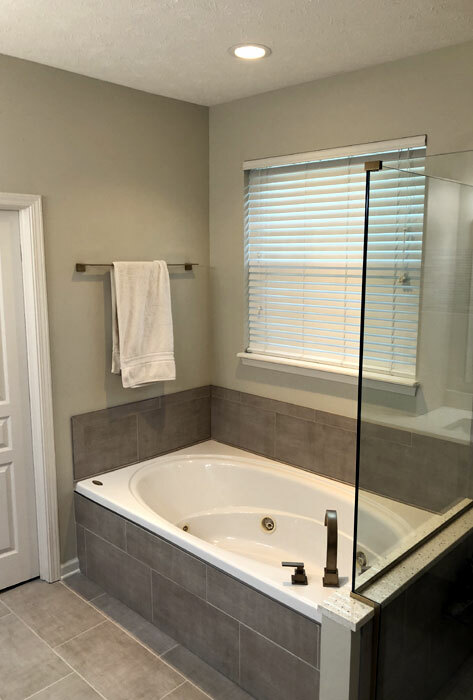 Though it is not always possible, we were able to re-use the client's existing drop-in tub. We simply replaced the faucet, tub splash and tub skirt with tile to match the new shower and floors. 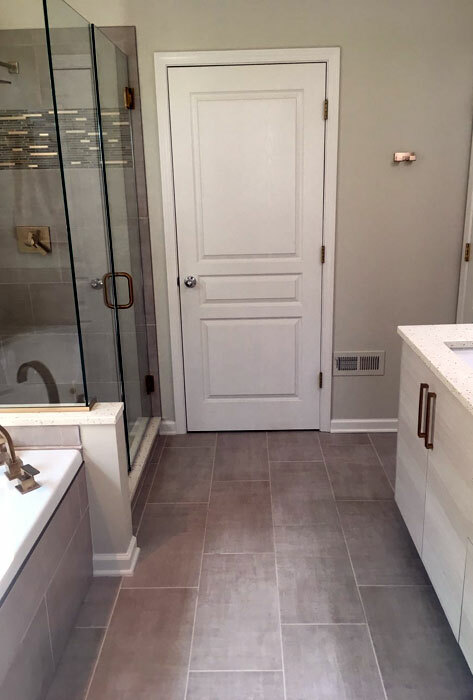 The sleek tile skirt maintains the modern, straight lines of the renovation and saved the client some additional expense. 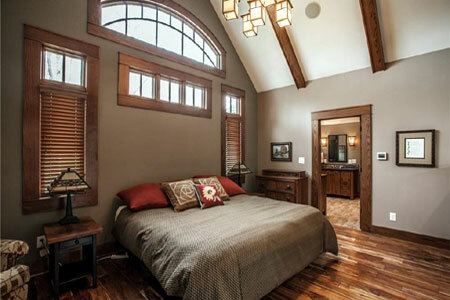 Finally, this bathroom highlights the benefits of large format floor tile. Running 12 x 24 tiles parallel with the length of the room lengthens the space and matches the traffic flow instead of working against it. Plus, there are fewer grout lines which results in less maintenance. 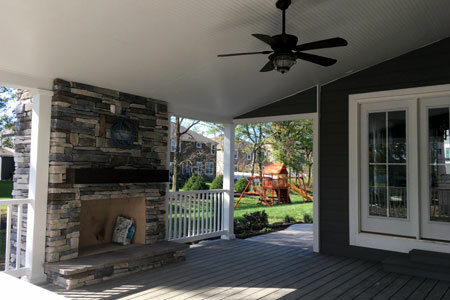 Sometimes the installation of large format tile requires additional prep work, but the results are usually worth it!